If nothing else, the Xperia X is impressive simply because it exists. The last Xperia phone that even had a chance to hit U.S. shores was the Verizon-exclusive Xperia Z4v. But that phone effectively fizzled into thin air in late 2015—along with Sony’s entire U.S. smartphone strategy. Or so it seemed. Earlier this year, Sony announced that it would drop its Xperia Z line of smartphones and re-brand. And so we now have the Xperia X, the first in a new breed of Sony devices. It’s a 5-inch, mid-tier smartphone wrapped in a boring plasticky chassis, and it’s nothing like Sony phones of yore. The Xperia X isn’t totally bad, mind you. It’s just not exemplary, and that’s sad, as Sony used to dress to impress for its Android users. Even worse, the new Xperia’s $550 asking price is outrageous considering there are plenty of other Android smartphones that cost less and do more. It really feels like Sony is phoning it in. The Xperia X is a comfortable 5-inch device, but won't win any design awards. Sony’s Xperia Z series had sharp design. The phones were wrapped in a fancy, water-resistant chassis made of metal and glass, and they felt premium compared to competing devices. But for the Xperia X, Sony’s packaging is a combination of glass, aluminum, and plastic. On the front, there’s a nice slab of glass covering the display, but the backside’s flimsy aluminum tells a different story, and polycarbonate on the sides pushes the X even further downmarket. The end result is a chassis design that feels like an afterthought. And it isn’t even water-resistant. The Xperia X’s glass-covered display offers the illusion of a premium device. But the backside tells a different story. It’s boring and plasticky. We lament the diminished design standards, but Sony does redeem the Xperia X with some other features. The phone’s dual front-facing speakers are loud enough to start a dance party in your backyard, and its 5-inch, 1080p LCD display is just the right size for people who are exhausted by all the ginormous smartphone options making the rounds. However, be forewarned that the display does suffer from slight over-saturation. It’s especially noticeable when you’re looking at the Xperia X at an angle. A thin build and compact body may draw you to the Xperia X. Also, while the Xperia X does have a fingerprint scanner embedded in its recessed power button, it’s been disabled for the U.S. market. As a result, you won’t be able to unlock the phone with your thumbprint, buy things with Android Pay (unless you enter your security pattern), or sign in to your bank account with just a tap. It’s like living in the past. The Xperia X uses Qualcomm’s latest mid-tier chip, the 1.4GHZ Snapdragon 650, which is the update to last year’s Snapdragon 615. It’s not a blazing-fast processor, but it’s enough for playing games and using Snapchat. The 3GB of RAM certainly helps, as well. The Xperia X’s Snapdragon 650 processor performed more impressively in Geekbench than both the Nextbit Robin and Nexus 5X’s Snapdragon 808. However, the Snapdragon 650 still trails a bit in GPU performance. You’ll be fine when playing casual games on the Xperia X, but anything more graphically intense will heat up the phone. Indeed, the device became almost scalding hot while playing with augmented-reality effects in the camera app. The phone will alert you when it’s on the brink of overheating, but this happened a few too many times during my week and a half of testing. Battery life is particularly impressive given its 2620mAh battery pack. On the flipside, the Xperia X’s battery life is pretty impressive. Its 2620mAh battery pack managed to outlast both the Nextbit Robin and the Nexus 5X. In PCMark’s rundown test, the X lasted a whopping 7 hours and 36 minutes, and in GeekBench’s test, it managed about 6 hours and 14 minutes. My daily use of the phone seemed to correspond with those numbers, though I saw a drastic drop in battery life after Snapchatting my way through a visit to the farmer’s market. The Xperia X’s 23-megapixel camera would be more capable if it had the support of OIS. The Xperia X boasts a 23-megapixel rear-facing camera with an aperture of f/2.0. However, the phone shoots in 8-megapixel mode by default, so you’ll have to go in and manually change the resolution if you want the full 23 megapixels. The camera is especially capable in well-lit situations, but it’s slow, taking a few seconds to save each photo after you’ve snapped an image. And, no, those save times don’t improve at lower resolutions. A sampling of test shots. You’ll notice that the colors are slightly over-saturated and overexposed. At dusk, the colors appear dull (far right photo). Despite its 23 megapixels, the Xperia X suffered with digital zoom. Notice the overexposed sky in the zoomed shot on the right. Even in our artfully lit video studio, the Xperia X could hardly keep it still without the extra light. The Xperia X employs what Sony calls phase detection auto focus. It works pretty well for tracking objects, but it makes it hard to lock on a focal point in the viewfinder. I like to keep auto focus on—it’s just one less thing to worry about—but I had little faith that the Xperia X would come through without me picking my focal point first. The Xperia X is a darling shooter when there’s lots of light available. It’s capable enough in low-light environments, but there’s too much graininess when you zoom into the photo. Sony insists that it doesn’t need optical image stabilization (OIS) because it employs its own branded BIONZ image processor. But I’m here to tell you that it desperately needs OIS, especially with this many pixels to corral. Low-light photos are grainy, and the Xperia X is particularly susceptible to even the slightest hand-shake. No, we weren’t in the midst of an earthquake. The Xperia X’s 13-megapixel front-facing camera also lacks OIS, and it’s hard to shoot a selfie while walking. You’ll notice the same issues with the 13-megapixel front-facing camera, too. I had to keep my hand absolutely still to avoid blurry images, and that’s a difficult balancing acting when you’re using the phone to capture everyday events. The Galaxy S7 produces exponentially better-looking selfies with fewer megapixels, and I don’t have to stand perfectly still for every GS7 photo. The Sony camera UI devotes too much space to its extra effects and not enough to its manual camera controls. Sony’s camera app is also bloated. I’d rather the company toss out its hokey augmented reality effects and opt for more robust Manual settings instead. The Xperia X also offers an exhausting list of “scene” choices, which seems counter-intuitive for a manual mode. Isn’t the whole point to enable you to manually adjust the camera settings? The Xperia X’s interface looks normal at first. There’s no way that Google would suggest I install the Chick-Fil-A app, considering I’ve never installed anything even remotely related. Why is Sony suggesting I install it? The app suggestions seem to be nothing more than pseudo-advertisements. I’m disappointed to see this kind of “added value” ploy bundled into a Sony phone—especially one that costs almost as much as an unlocked, all-stock Nexus 6P. Thankfully, installing any other legitimate launcher will eliminate these recommendations, but it’s unfortunate to see Sony take this route. Sony does bundle in a few of its own apps in hopes you’ll use them. Scroll further in app drawer and you’ll see that Sony has pre-loaded a number of its own apps—because its 2016, and the phone manufacturers are still pushing their ecosystems. There’s an app for Sony’s Lifelog, which tracks your health and fitness; a PlayStation app that essentially takes you to the PlayStation online store; and a Music app that offers access to locally stored music files, Spotify, and even your home media server. Um, Sony? You’re a little behind on security updates. There’s also a bit of bloatware, like the AVG Protection suite with 180 days of Pro service. It can’t be deleted, and includes a bogus feature that lets you see “who’s trying to break into your phone.” To make matters worse, Sony is lagging on security updates: My Xperia X review unit was three months behind on security patches at the time of review. We can only assume that retail customers will get the latest security update, but maybe this is why Sony bundled in the anti-virus suite. The Xperia X is compact and easy to use, but its few flaws and exorbitant price tag make it less intriguing. It’s difficult to imagine just what Sony is expecting to accomplish with this re-imagined smartphone line. 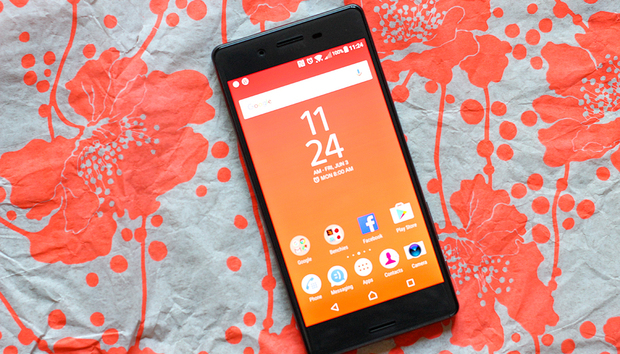 The Xperia X feels like a step backwards, but it’s billed as Sony’s 2016 flagship device. And at $550, it’s got a flagship price. If you’re absolutely committed to Sony hardware, and are desperately aching to put one of the company’s smartphones back into your hands, I suggest you wait until the Xperia X is at least $100 cheaper. Otherwise, I would just buy a Nexus 5X or 6P, both of which have working fingerprint sensors, and promise the fastest OS and security updates in the Android universe. You could also wait for a few other Sony models arriving later this summer. On this tip, I’ll be curious to find out why Sony didn’t lead with its Xperia X Performance model rather than this mid-range phone with a high-end price tag.